One of my favorite things to gift people for Christmas or thank-you presents is handmade soap. While there are tons of complicated recipes for soap using real lye out there, I like using pre-made soap bases and adding the colors and scents I love best (and always using essential oils because they much higher quality than other fragrances). My boys and husband also appreciate handmade soap with scent blends that are woodsy, spicy, and masculine. 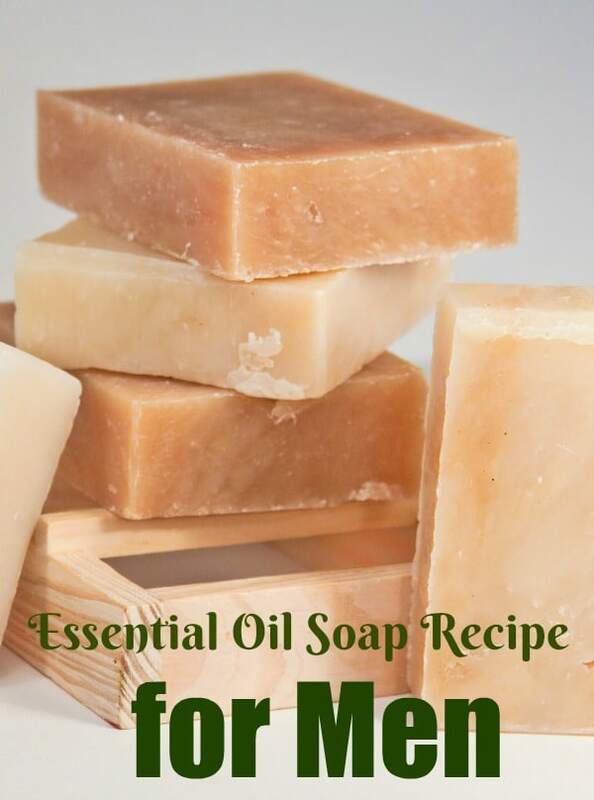 The following oil blend is my favorite essential oil soap recipe for men because it is so easy to make and smells wonderful! The men in my life absolutely love this smell and it would make the perfect stocking stuffer for teen boys and husbands. I love using soap bases in my homemade soap recipes because melt and pour soap is easy enough for anyone to do and doesn’t require any special equipment. Soap base (I love how smooth goat’s milk soap is, but my husband really likes the moisturizing properties of coconut oil). I typically go with one pound. Making the soap is easy. When I’m making masculine soap recipes as gifts for men, I don’t even dye the soap. The natural color of the soap gives a perfect “manly” look to the bars. Melt the soap base on low heat on your stove using a flat-bottomed pot. You can also melt the soap base in a slow cooker. You can add additional flavors, but I find that scents get confusing if you add more than four to a recipe. Mix the essential oils into the soap until well combined. If you don’t want to purchase all of these oils at once or are missing some, Rocky Mountain Oils has a skin care blend that includes many of the oils mentioned above. 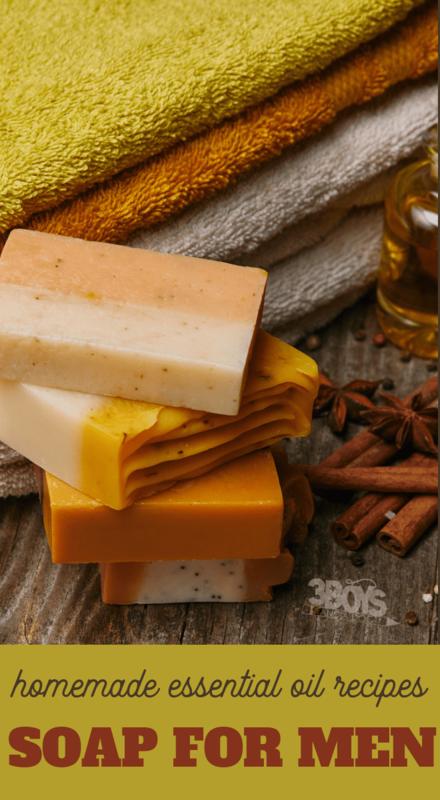 The clean scent is the perfect fragrance oil blend to add to a soap for men recipe if you’re on a budget. Pour the soap base into your soap mold. Tap gently on a flat surface to remove any air bubbles. Dabbing a little rubbing alcohol on the top helps knock out the ir bubbles, too. Wait 24 hours for the soap to dry before popping it out of the mold. Tie the bar soap with raffia if you are giving them as a gift, or place them directly in your bathroom. This soap recipe smells heavenly! 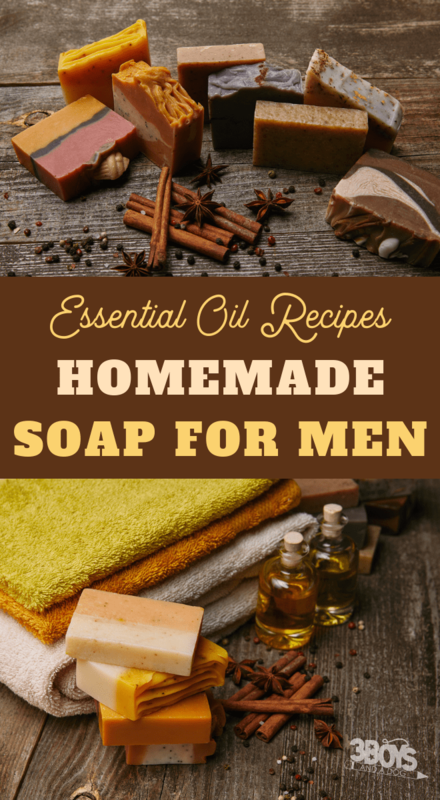 I have actually written an entire article to help you choose manly essential oil blends as you make soap for your man. 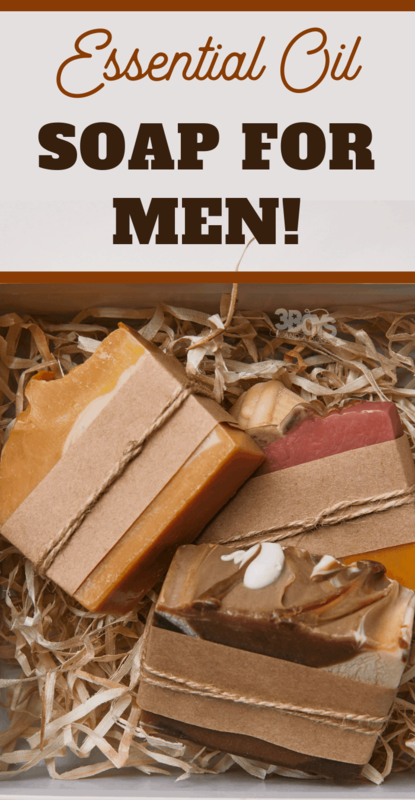 This homemade soap makes a great Father’s Day gift for your husband and Daddy! Don’t know if I’m missing it but how much soap base are you using in this recipe? I work with a pound, but I intentionally left off the amount because it really doesn’t matter as long as you keep the oils to the right amount to keep it from getting “greasy” looking. How much soap base do you use to this recipe of 5drops of each oil? Thank you for the article, making your own soap is awesome and the natural ingredients will mean your skin loves you, this is a recipe that may also lend itself to beards there’s nothing better than a good quality homemade beard soap.